We make products that you use to carry your children so we take the issue of safety seriously. We are dedicated to making slings which parents feel confident using against delicate newborn skin and this is a key consideration during every stage of the process of product development and manufacturing. We handcraft our slings in our workshop just outside of Edinburgh, Scotland, taking care to use only sustainably sourced and eco-friendly materials in both our products and packaging. We ensure all of our products meet the required standards in the European Union and the USA and all materials used to make our products have passed mandatory testing, so you can be assured that used correctly your Oscha sling will give you a safe and secure experience for you and your child. Our structured carriers, the Cairis and Coorie, have passed testing for the EU regulation BS EN 13209-2:2005 and the US regulation ASTM F2236-14. Our Toy Slings and Toy Ring Slings are tested to a number of required EU and US standards for children’s toys. 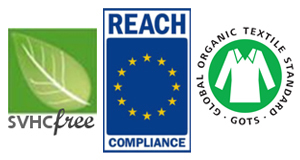 The dyes used in our fabrics all meet EU Regulation, Evaluation, Authorisation and Restriction of Chemicals (REACH) and are free from Substances of Very High Concern (SVHC). We only use fibre reactive dyes for our yarns, this is to ensure that they are safe for use against bare skin, but this also means that we are not contributing to any environmental pollution in the dying of our yarns. The rings used in our ring slings have been tested to ensure that they pass force requirement standards in the EU. All of our fabrics are Oeko-tex certified, and fabrics containing organic material meet GOTS (Global Organic Textile Standards) – this includes our organic totes which we use to package your sling.